Pueblo Crime Stoppers encourages anyone with information about the cases featured below to submit a webtip. Ian was last heard from on the morning of 01/04/2017 and has had no contact with his family ever since, which is unusual. 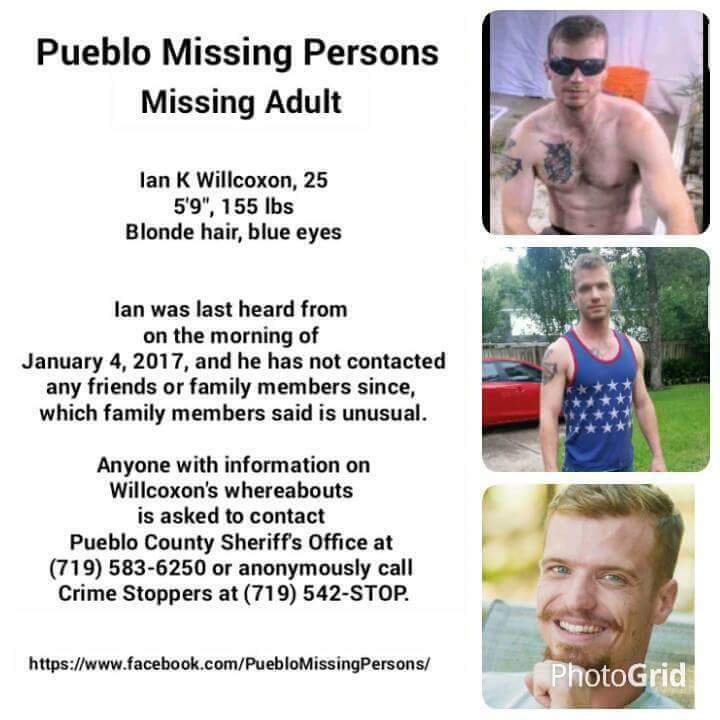 Anyone with information regarding Ian's whereabouts is urged to contact the Pueblo County Sheriff's Office at (719) 583-6250 or anonymously call Pueblo Crime Stoppers at (719) 542-STOP. Pueblo West resident Thomas R. Cook has been missing since 08/17/2013. Pueblo County Sheriff’s Office is asking for help from the community. On August 17, 2013, Thomas (Tommy) left his father’s home in Pueblo West. Thomas said he intended to go to Kansas, where he had lived before moving to Pueblo West. Thomas left the home without any personal belongings. More than a year has gone by without any signs of Thomas. PCSO detectives have been working with Kansas authorities with no signs of Thomas in either state and he hasn’t been contacted by law enforcement anywhere else in the country. Mr. Cook is a bi-racial man with brown hair and brown eyes, 5’08” and 180 pounds. He was last seen wearing a white t-shirt and blue jeans. If anyone has information on Thomas Cook they are asked to contact the Pueblo County Sheriff’s Office (719)583-6250. To remain anonymous contact Pueblo Crime Stoppers @ 542-STOP (542-7867). Where, if your information leads to a felony arrest, you could be eligible for a cash reward. Pueblo Police Department Detectives are asking for assistance in located a missing person. Family members reported to police that 42 year old Keith Ebrecht has gone missing. 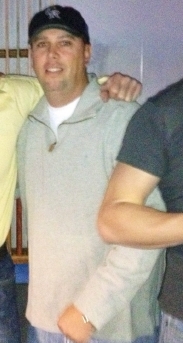 Ebrecht was last seen visiting local bars on July 2nd into the early morning hours of July 3rd, 2013. On July 10th a vehicle belonging to Ebrecht was found damaged and abandoned. The vehicle was a black 2011 Chevy Camaro SS with silver racing stripes down the middle of the car. Ebrecht is described as 5’9”, around 160 lbs with brown hair and hazel eyes. If anyone has any information regarding the whereabouts of Keith Ebrecht or the abandoned vehicle, you are urged to call Pueblo Police (553-2502) or Pueblo Crime Stoppers @ 542-STOP (7867). On the evening of 02/04/13 at approx. 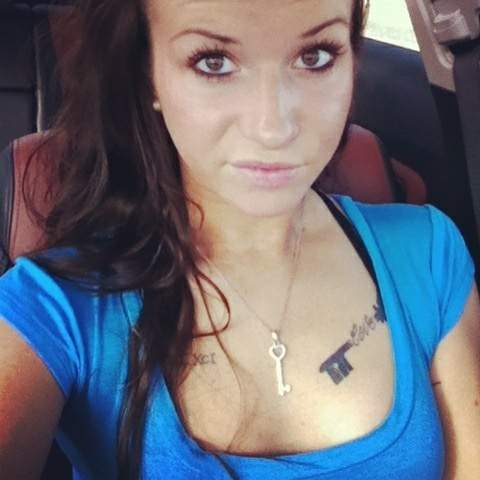 2200hrs, Kelsie Schelling , a 22 year old female came to Pueblo in her 2011 black in color Chevrolet Cruz to meet an acquaintance. Schelling was to meet her acquaintance at Walmart, 4080 W. Northern Ave. According to cell phone records, Schelling did make it to her destination. Schelling’s cell phone records show she was in the Pueblo area until her cell phone battery lost power on 02/07/13. On 02/14/13, Schelling’s black in color Chevrolet Cruz was located at St Mary Corwin Hospital, 1008 Minnequa Ave. After reviewing the surveillance video it appeared the car parked in the parking lot at approx. 0530hrs on 02/07/13. Upon reviewing the video survelliance from Walmart, Schelling’s vehicle was parked on the south end of the parking lot in front of the General merchandise section on 02/05/13 at approx. 1205hrs and left there overnight until 02/06/13 at approx. 0720hrs when an unidentified male picks the car up and drives off. Kelsie Schelling is a white female who is 5’03 inches tall and weighs 120 lbs. She has shoulder length brown hair and green eyes. Attached is the photo containing Schelling’s visible tattoos. "I`m Colby Schelling. Kelsie Schelling is my sister. Kelsie has been missing since February 4, 2013. Her family has not seen or heard from her since. Kelsie is a faith-filled person with a very big heart and an electric smile. Kelsie is very close to her family and friends and would never go this long without talking to anyone. We would like to thank everyone for their support during this trying time. Thank you to the media who are helping us to spread the word, the Pueblo Police who are working diligently on her case and to everyone who has offered prayers and kind thoughts on Kelsie`s behalf; but we still need help. Kelsie is always quick to lend a helping hand and now we`re asking everyone to continue lending a helping hand to Kelsie. If you know anything at all regarding Kelsie`s disappearance, please reach out to Crime Stoppers or the Pueblo Police. For additional information and pictures of Kelsie, please visit findkelsie.org. We all love and miss Kelsie very much and want to do whatever it takes to bring her home." Pueblo Police need your help in locating a Jessica Eileen Ortiz. Jessica has been missing since April 12th, 2007. According to Police reports Jessica was last seen at Classic Q bar (located at 1715 S. Prairie Ave) with her boyfriend Wade Albrow. Jessica has had no contact with friends or family since April, which is very uncharacteristic of her according to her family. 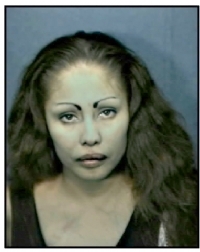 Jessica is described as a 29-year-old Hispanic female, 5`1" tall, 135 lbs, with brown hair and brown eyes. If you have any information that could help police and the Ortiz family locate Jessica, you are asked to call Pueblo Crime Stoppers @ 542-STOP (542-7867) or submit your information on-line by visiting our web site at www.pueblocrimestoppers.com. If your information leads to a felony arrest, you could earn a cash reward. Pueblo Police are asking for information that would help in locating Russell Brian Jaramillo. 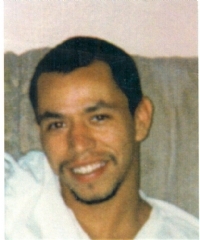 Russell has been missing since July 2, 2001 and was last seen in the area of 26th Street and Elizabeth near the "Slabs." Russell Jaramillo was 22 years old when he went missing. He is described as a Hispanic male, 5`-7" tall, 140 lbs, with brown hair and brown eyes. His last known address was 1421 E. 13th Street.If you have any information that could help police and the Jaramillo family locate Russell, you are asked to call Pueblo Crime Stoppers @ 542-STOP (542-7867) or submit your information on-line by visiting our web site at www.pueblocrimestoppers.com. If your information leads to a felony arrest, you could earn a cash reward. 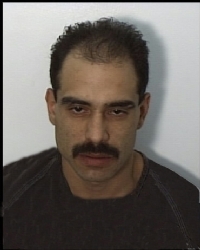 Charles Madrid was 30 years old when he was reported missing. He is described as a Hispanic male, 5`-10" tall, 150 lbs, with brown hair and brown eyes. His last known address was 1806 W. 13th Street. If you have any information that could help police in this case, you are asked to call Pueblo Crime Stoppers @ 542-STOP (542-7867) or submit your information on-line by visiting our web site at www.pueblocrimestoppers.com. If your information leads to a felony arrest, you could earn a cash reward.